Last weekend, we had a jam-packed, fun-filled adventure with our friends, Jocelyn, Matt, and Yuri as we explored Long Island! One of our stops was Sagamore Hill, home of our 26th POTUS, Theodore Roosevelt. 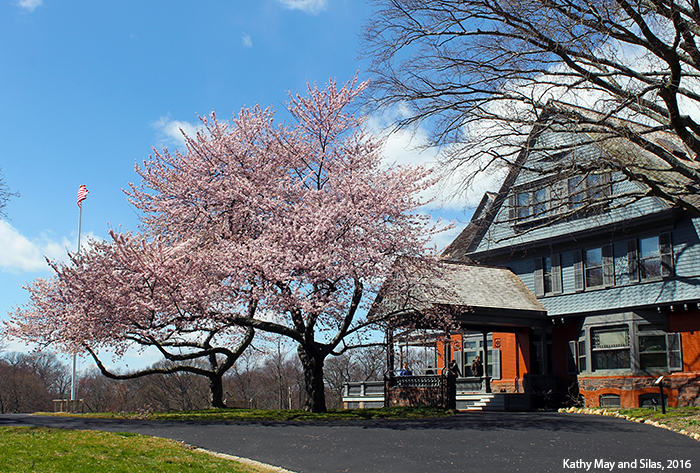 Even though the air was chilly during our visit, the cherry blossoms in front of Sagamore Hill were in full bloom after our mild winter. 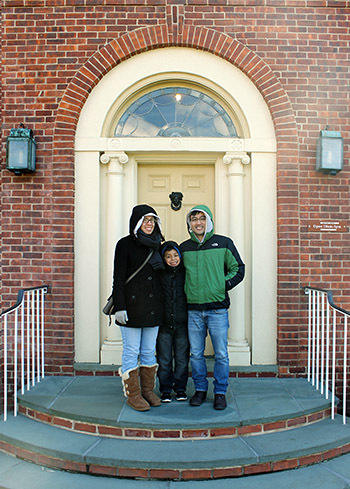 When it was time for TR, a native of Manhattan, and his wife, Alice, to build a family, they chose Oyster Bay because of TR’s fond childhood vacation memories there. Tragically, Alice died of complications related to childbirth before the Queen Anne-styled home was complete. However, TR continued construction for his new daughter, named Alice after her mom. Originally named “Leeholm” after his wife, TR decided to incorporate Sagamore, the Algonquin word for chieftain, into the title of his iconic estate. TR, his second wife (Edith), and his six children lived in the 23-roomed mansion before and after his presidency. It became known as the “Summer White House” because TR hosted prominent national and global figures there during his seven summers of presidency. As an aside, don’t confuse the “Summer White House” with the “Little White House,” which belonged to the other President Roosevelt (Franklin Delano, 32nd POTUS) in Kathy’s home state of Georgia. TR and FDR are fifth cousins in the Roosevelt family, a powerful business and political dynasty. While TR was on the Oyster Bay branch of the family, FDR was a member of the Hyde Park branch. Interestingly, FDR’s wife, Eleanor, was the favorite niece of TR (making FDR and his wife fifth cousins, once removed). During his presidency, TR gave away Eleanor at her wedding. At the reception, TR said, “It is a good thing to keep the name in the family.” Family did not define politics, however, as TR was a Republican while FDR was a Democrat. Despite their differences, the beginning of FDR’s political career can be attributed to TR. When he first ran for senate, FDR was chosen by his local party as a “paper candidate” because his Republican cousin TR was still very prominent in American politics, and having a Democratic Roosevelt was good publicity. By the way, even though he was the underdog, FDR won. We also visited the Theodore Roosevelt Museum which is located on the grounds of Sagamore Hill. 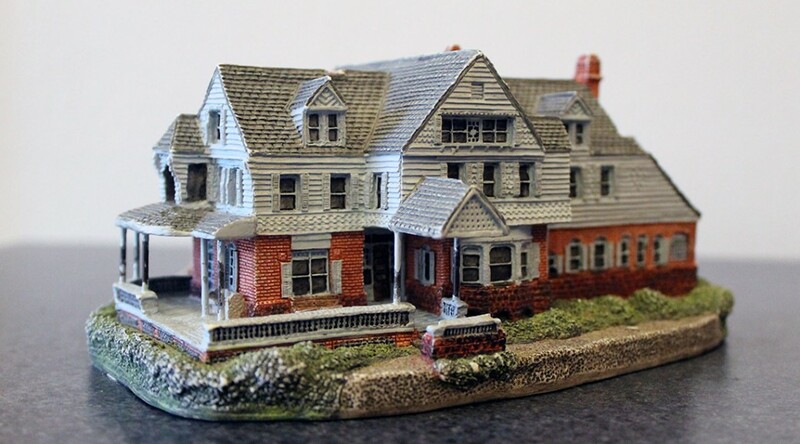 It is housed in Old Orchard, the home of Brigadier General Theodore Roosevelt, III (known as Ted, Jr.), TR and Edith’s eldest son and winner of the Medal of Honor. 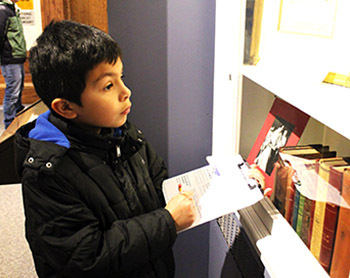 At the museum, Yuri decided to take on the Junior Ranger challenge, the Theodore Roosevelt History Hunt. He was given an Activity Booklet by the National Park Service Park Ranger and then, as a history-detective, he searched for answers to questions about TR and his life. During the challenge, Yuri learned all about the bigger-than-life TR. Here Yuri is recording his data. Hugely popular during his time, TR was a charismatic man who exuded energy, athleticism, and power in his cowboy persona. Even though he was a little gun-happy in his efforts to hunt big game before they disappeared, TR also put great efforts into conservationism, preserving hundreds of thousands of acres of national land for future generations. Sometimes he supported war (posthumously won the Medal of Honor for his fighting with the Rough Riders in the Spanish-American War) and sometimes he kept peace (won the Nobel Peace Prize for negotiating the end of the Russo-Japanese War). He is remembered for his domestic policy (“Square Deal” that controlled corporations and protected consumers); his foreign policy (“Speak softly and carry a big stick,” a West African proverb); and his overall tenacity (delivered a 90-minute speech after being shot into the chest, saying “It takes more than that to kill a bull moose.”). After answering every single question, Yuri returned his completed Activity Booklet to the Park Ranger, who scored the answers. 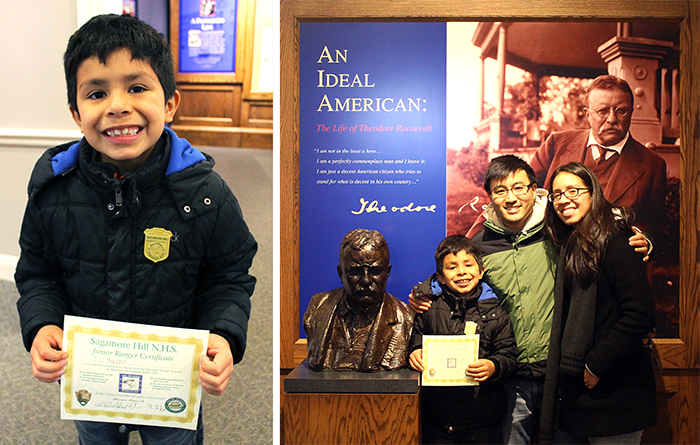 The Park Ranger presented him with an authentic Sagamore Hill Junior Ranger Badge and an official Junior Ranger Certificate. We were so proud of Yuri’s hard work! Here is a picture of him displaying his prizes and another picture of him celebrating alongside Jocelyn, Matt, and the bust of TR himself. Did you know that teddy bears are named after TR? During a hunting trip in Mississippi, all members of the party except for TR had found bears. You can’t invite the President of the United States on a hunting trip and have him fail, however, so the guides trapped a bear, tied it to a tree, and called for TR to shoot it. TR refused to shoot the defenseless bear because that would be unsportsmanlike (though, technically, the bear still died because TR ordered it be put down to end its pain and suffering). Word of the incident reached the public and soon, a Brooklyn candy shop owner and his wife put two handmade bears in the window with the label “Teddy’s bears.” The teddy bear was born. This bit of TR’s legacy is ironic because he had open disdain for the nickname “Teddy” (actually, his family called him “Teedie” instead), but it stuck because the general American public adored it. The fun facts about one of the most influential leaders of our country and one of the most genuinely intriguing men in history can go on and on… but we should probably stop here for now. P.S. Among the other great places we visited on our Long Island tour, we saw a very big duck on the side of the road. See our adventure with The Big Duck of Flanders by clicking here.